Many gardeners include white potatoes in their growing repertoire, faithfully rotating them through their garden space year after year. Sweet potatoes on the other hand, aren't included as often but deserve to be! Sweet potatoes are surprisingly easy to grow in the garden -- especially with these tips -- and reward you with a plentiful harvest at the end of the season. As an added bonus, their beautiful lush vines add interest to your landscape and garden. The longer you can keep tubers in the ground once it begins to cool down, the better. Their flavor and quality improves in cooler weather. Depending on the variety you choose to grow and it's maturation length, adjusting the planting time so tubers will be mature in late September. Unlike white potatoes, the vines on sweet potatoes won't die when the tubers are ready to harvest. Aim to keep the tubers in the ground as long as possible. When the vines begin to yellow at the tips of the leaves, plants are ready to harvest. If your area receives a hard frost before you can harvest your sweet potatoes, dig them up immediately. A frost will blacken the vines and tubers will rot quickly afterwards. To make harvesting easier, you can use garden shears to remove the tops of the vines before digging. Cut the stem a few inches above the ground, leaving a "handle" of sorts to grab onto. Using a gardening fork, or spade fork, loosen the soil about 18" out around the entire radius of the plant. This will make it easier to pull the plant out of the ground. Digging is easier when the soil is dry. Gently pull the sweet potato plant out of the ground using the stem as a handle. Shake off as much soil from the roots as possible and lay the plant on the ground. 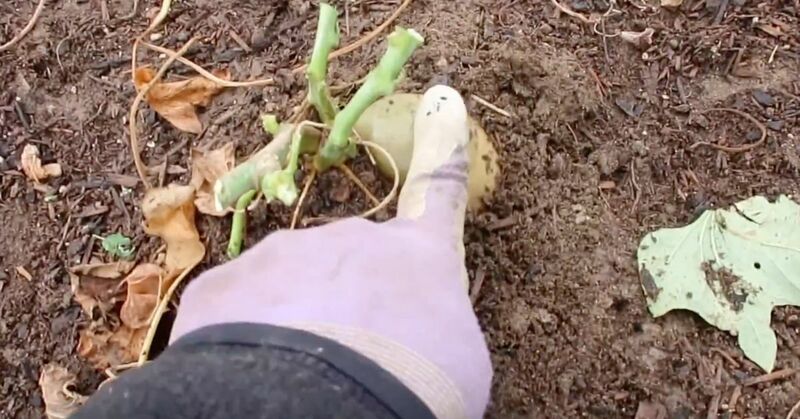 Use your hands to rummage through the soil and roots, removing the sweet potatoes. Avoid using a shovel as it can mar the flesh and increase the chance of rot or bacterial infections. Gardening Know How talks about the various types of rot, what causes them, and how to prevent them. Your potatoes may be damp and dirty if your soil was still fairly moist. Lay the potatoes outside for a couple of hours, but out of direct sun, to let them dry. After they have been allowed to dry, use a soft brush, clean cloth, or your hands to brush off as much remaining soil as possible. Do not rinse them under water to remove the soil! Sweet potatoes need a curing period for their sweetness to develop. Store them in a high humidity space, maintaining the temperature between 80 and 90℉, for ten to fourteen days. Once the sweet potatoes have been cured, move them to a long term storage space. Ideal conditions will be about 55-60℉, with relative humidity about 75%. Do not let the temperature of your storage space drop below 50℉. If you don't have a good indoor space, The National Gardening Association explains how to build potato mounds for outdoor storage.